Unikernels are unfit for production : while i don't agree with a lot of the arguments ( and the lack of concrete data supporting them) one really struck : unikernel are really hard to debug. 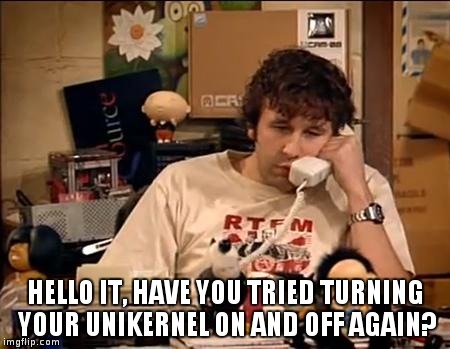 Unless you have a toolkit like Erlang where you can remotely login / debug unikernel are really a tough nut to crack when it comes to root cause analysis. Yes you can always "turn it on and off again" but this is just masking a problem that can come back and bite you hard later. Webdam : Web data management book that tries to cover the many facets of distributed data management on the Web. Really great read if you want to have a good overview of the web scale industry and the techniques used. Nano Lambda : the rise of the next PaaS stack is coming. I predict we will see more and more startup venturing in the Lambda platform field. However what they really need to work in is offering simple and intuitive tools to orchestrate and scale the system. The "simple" running lambda code will not be sufficient for long enough.